This entry was posted on June 2, 2018 by Mark Hutchby. Local art shop is proud to be run by artists for artists and we always enjoy our customers coming in and asking questions or sharing their techniques with us. We've noticed that we get a few questions regularly so we thought we would try and cover these frequent queries. In this post we will start by looking at paper and paints. Hot or Cold, Rough, HP, CP? Watercolour paper comes in various textures, which texture will be a personal preference but if you have a particular subject in mind to paint the texture can make a difference. Hot press (HP) this is a smoother finish to the paper as it has been compressed to create a harder surface. This does make the paper less absorbent than other finishes. The smooth finish to the paper makes it popular with botanical artists, as it allows them to be very accurate. Cold Press (NOT) this is the most popular finish and recommended for beginners. The paper is slightly textured, this makes it ideal for washes but also for finer detailing. Rough this is the most textured of the papers and as a result the most absorbent. Due to the highly textured surface it can make it difficult to control brush marks. The texture can add effect to work as water can collect in the indentations. Once we have chosen the texture of paper we need to consider the weight. Essentially the heavier the paper weight the more absorbent the paper. This means you can use techniques such as wet on wet. For a beginner 300gsm or 140lb is a good starting point, however you may find you need to stretch the paper for it to retain its shape. Pads are useful to take out and about and painting plein air and will come in a variety of sizes. 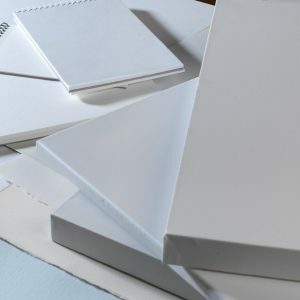 Gummed pads allow you take peel off your completed work and your next sheet is ready to use underneath. A spiral bound pad allows you to flip over your finished work to show the next sheet which make them ideal for travelling as your work stays safe in the pad. Blocks are sheets of paper gummed on all four sides, this means they do not require stretching before use. Once you work is dry you simply slice the top sheet off and it is ready to be used again.. Sheets can be purchased in packs or individually. A full imperial sheet is 30”x22” which can be cut down to any size. Lower weights of paper may need stretching before use . First thing we will cover is something that has been coming up a lot recently. There is no right or wrong side to your paper. With modern paper manufacturing there is not really any difference between either side of paper. There will be some variation in texture, which will become more obvious as you get to know your craft better but at the end of the day it’s down to personal preference. If you have used sheets that are watermarked it is recommended that you have the watermark the right way round in the corner but again this is completely up to you. 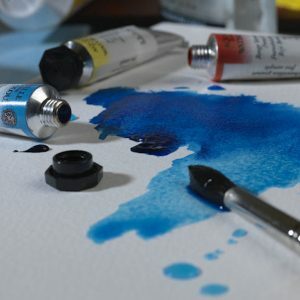 Watercolour paints are pigments mixed with Gum arabic and other components. The Gum arabic ensures the pigment adheres to the paper. Watercolours are a transparent paint and are thinned with water. The difference between student and artist level paint is the pigment. Student level paint contains a higher level of binders which is cheap, this makes the price more affordable. As there is less pigment the paint you will not get the same level of coverage and the range of colours is lessened, as some colours are not reproducible to a lower price point. With student level paints you will see hues, rather than the true colour. As some pigments as very expensive the student level paints will contain combinations of other colours that is close to the true pigment. As student level paints contain more binder the colour shift when dry is greater. As pigments can vary in price manufacturers group the raw materials into grades. The higher the grade the more expensive the pigment and therefore the paint. There is no right or wrong choice between tubes and pans. Whilst pans could be said to be more suited to plein air and tubes are easier to mix and blend, ultimately it will be personal preference. Tubes and pans can be used together with no issues and can be mixed and blended. Pans are easy to store and transport, they are ready to use with the application of water and if they become contaminated you only need wipe them. When ‘activating’ your pan you need to be careful not to be tempted to ‘scrub’ to try and pick up the paint as this can cause damage to your brushes.